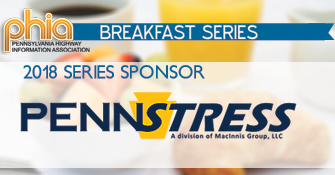 The fourth and final bidding on the northern section of the Central Susquehanna Valley Thruway took place last week, and we thought this would be a good time for an update on the project. The CSVT is a rare new capacity project funded by Act 89 of 2013. The vast majority of construction projects made possible by the funding act are focused on restoring existing bridges and highways. The paving for the project will begin next year, with completion set for 2022. Completion for the southern section is up in the air due to the need to re-route a section of the thruway to avoid building it over fly ash basins. 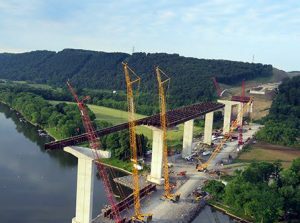 Despite the record-setting rainfall this construction season, PennDOT reports that construction of the bridge spanning the Susquehanna has fallen behind only by two to three weeks. The Union County side of the bridge is expected to be completed by the end of October, except for the paving. A four-lane, 13-mile limited access highway will separate trucks and through traffic from local traffic, reducing congestion, improving safety and accommodating economic growth. PennDOT let just over $101.7 million projects during the month of September according to numbers compiled by the Associated Pennsylvania Constructors (APC). With this letting, PennDOT has let just over $1.74 billion in project lettings to date. At this same point last year, PennDOT bid a total of $1.89 billion in projects. The official 2016 year-end total was $2.594 billion just shy of PennDOT’s $2.6 billion forecast. PennDOT anticipates a $2.4 billion letting program by year’s end. As in year’s past, PHIA will continue to track contract lettings on a monthly basis. To view the full September letting report and year comparisons, click the link below. *The report lists the total contracts awarded at each letting date, a comparison to the same period in the previous calendar year, and letting adjustments made since the previous month. PHIA staff will track PennDOT lettings throughout the year and provide monthly update. Last week, Governor Tom Wolf and Department of Transportation Secretary Leslie Richards announced transportation projects all over the state that would be funded using money from the Multimodal Transportation Fund. The list of projects include 37 highways, bridges, bikes and pedestrian paths; these improvements total $40 million. The projects are regionally diverse, and include more than $3 million for road improvements in Carlisle; $4.6 million to Philadelphia for roadway improvements, as well as the creation of bike and pedestrian paths near local elementary schools; and millions to the rest of the state. The Multimodal Fund was created by Act 89, the comprehensive, multi-modal funding legislation of 2013. This bill created dedicated streams of funding for transportation improvements, an investment of $2.4 billion by the state. Funds are generated by the elimination of the flat gas tax, and uncapping the wholesale oil franchise tax. PennDOT let just over $283 million projects during the month of September according to numbers compiled by the Associated Pennsylvania Constructors (APC). With this letting, PennDOT has bid a total of $1.893 billion in 2016 to date. At this same point last year, PennDOT bid a total of $2.061 billion. The official 2015 year-end total was $2.594 billion just shy of PennDOT’s $2.6 billion forecast. 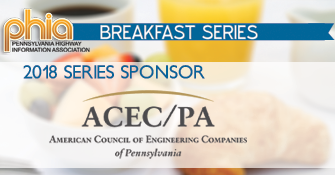 PennDOT reported at the annual meeting of the APC that 2016 lettings are expected to be $2.4 billion. At this rate, PennDOT would exceed its 2016 program forecast goal of $2.4 billion. Auditor General Eugene DePasquale audited the Pennsylvania Turnpike Commission and found potentially troubling news for the state’s comprehensive transportation system if the General Assembly does not address the onerous financial obligations facing the commission. 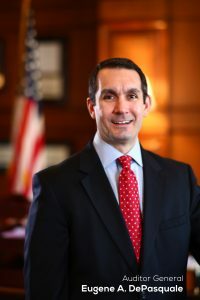 The audit covered the performance of the turnpike over the past two years, and found that with toll increases, the commission collects between $12 million and $20 million annually; however, DePasquale also noted that the commission has set very high projections for traffic and he does not expect them to be met. PennDOT let $175.9 million projects during the month of August according to numbers compiled by the Associated Pennsylvania Constructors (APC). With this letting, PennDOT has bid a total of $1.611 billion in 2016 to date. At this same point last year, PennDOT bid a total of $1.795 billion. The official 2015 year-end total was $2.594 billion just shy of PennDOT’s $2.6 billion forecast. PennDOT reported at the annual meeting of the APC that 2016 lettings are expected to be $2.4 billion. With the 2013 enactment of the transportation funding bill (Act 89) there is reason to see increased lettings. Act 89, which will implement a $2.3 billion comprehensive transportation funding plan over the next five years, will result in PennDOT exceeding the $2 billion construction lettings mark for years to come. To view the full August letting report and year comparisons, click the link below. PennDOT let over $106 million projects during the month of July according to numbers compiled by the Associated Pennsylvania Constructors (APC). With this letting, PennDOT has bid a total of $1.435 billion in 2016 to date. At this same point last year, PennDOT bid a total of $1.712 billion. The official 2015 year-end total was $2.594 billion just shy of PennDOT’s $2.6 billion forecast. PennDOT reported at the annual meeting of the APC that 2016 lettings are expected to be $2.4 billion. To view the full July letting report and year comparisons, click the link below. 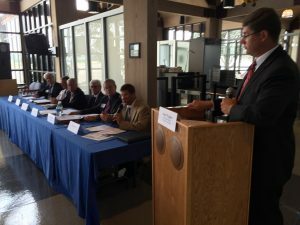 About 70 transportation supporters attended the first in a series of regional events promoting Act 89 this week in Lancaster. The attendees heard a panel discussion featuring PennDOT Deputy Secretary Jim Ritzman, Lancaster Chamber CEO Tom Baldrige, High Steel’s Steve Bussanmas, Good Transport Services President Danny Good, Jeff Glisson of South Central Transit Authority and Bob Bini of the Lancaster County Planning Commission. The event was a collaboration between PHIA and the Chamber and was sponsored by Sable Commercial Realty. PHIA is in the process of organizing additional events later this summer and into the fall, in keeping with its mission to educate the public about transportation issues. Look for information about future regional events as details become available. Read the news coverage of the event by clicking, HERE. PennDOT let over $240 million projects during the month of June. With this letting, PennDOT has bid a total of $1.335 billion in 2016 to date. At this same point last year, PennDOT bid a total of $1.421 billion. The official 2015 year-end total was $2.594 billion just shy of PennDOT’s $2.6 billion forecast. PennDOT reported at the annual meeting of the Associated Pennsylvania Constructors (APC) that 2016 lettings are expected to be $2.4 billion. To view the full June letting report and year comparisons, click the link below.